While we can’t remove styles supplied by Apple, we can remove custom settings, as this article explains. Because I want to reuse this text style multiple times in my project, I’m saving both Format and Style attributes. Format saves everything in the Basic text setting of the Text panel in the Inspector. Style saves everything in the Text panel, except what’s in the Basic text setting. In this dialog, give the Style a name so you know what it is. I’m picking something obvious. Final Cut saves the setting, then displays it, in alphabetical order, in the Styles list. NOTE: Deleting items that appear in Final Cut menus is always done most reliably by first quitting Final Cut. Make the Finder active. Then, press the Option key when opening the Go menu. Select Library. 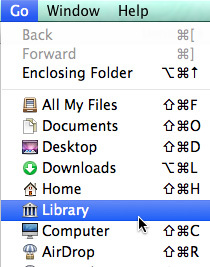 NOTE: The Library option only appears when the Option key is pressed while accessing the Go menu. 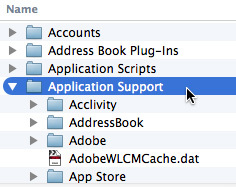 In the Library, twirl open Application Support. Scroll down till you find the Motion folder. Then, open Motion > Library > Text Styles. Delete both the .molo and .png files of the text style you want to remove. When you restart Final Cut, the option will be removed from the Style menu. With the release of FCP X 10.3, creating text styles now creates three files, rather than two, in the Motion > Library > Text Styles folder. Also, with the initial release of 10.3, as a reader points out below, deleting these styles does not remove the Style name from the Style menu. Deleting a style from the style menu does not delete any styles applied to clips in the Timeline. Styles are presets, once applied, they are disconnected from the text. thanks for text info and smiling giraffes. It seems that there are 3 associated files created and on my system there were no file extensions visible so I had to guess because I had inadvertently hit save several times which created multiple preset files with the same name except it added a 1 and 2 to the dupes. However these did not show up in the finder window so some stealth detective work helped to figure it out. Why don’t file extensions show up for me as they do in your description of the process? The display of file extensions is a Finder preference. Change it in the Finder. Larry, I tried this on the new update 10.3. 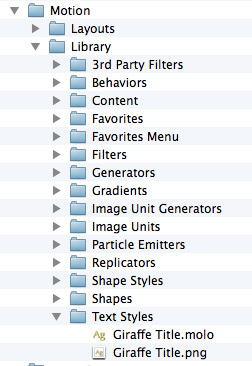 I deleted my custom settings in the text styles folder, but they still show up even after restarting final cut. The custom settings don’t work when applied but they still show in the list. Any clue why? I agree, delete the three files created by FCP X 10.3 does not remove the style from the list. I’ll check into this. Any update on why styles are NOT removed from the menu in FCPX 10.3? We can now delete custom text styles, but it is a two step process. As indicated in the article above, FCP X 10.3.x creates three files – menu.png, .molo, and .png for each style format. * As described above, go into Library > Application Support > Motion > Text styles and delete all three files associated with the text style you want to remove. * Next, press and hold Option + Command and restart FCP X from the Dock. Click the blue button to Delete FCP X Preference files. The styles and its listing in the menu are now deleted. 2D styles seem to be pre-empting my fonts. When I use a font, it changes depending on what 2d styles is set to. How can I just get the font I select without 2d styles affecting it? The 2d styles menu is always set to something.